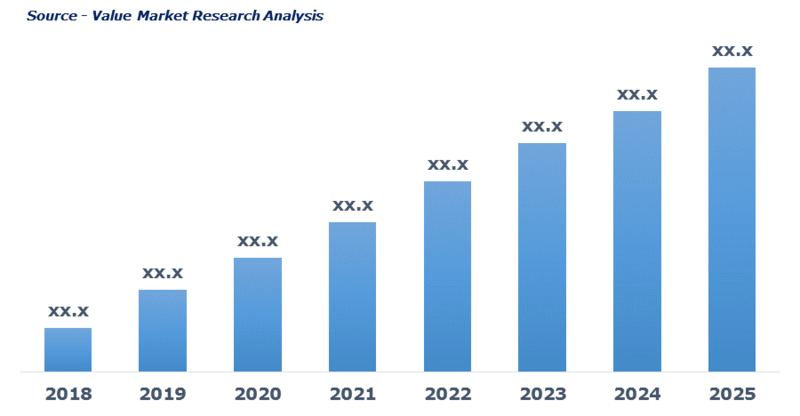 Growing geriatric population coupled with the rising prevalence of osteoarthritis, rheumatoid arthritis, bone cancer, and other musculoskeletal disorders are driving the market growth. Growing count of sportsperson suffering from bone ligament joint injuries is again pushing the market growth. Growing adoption of arthroscopy owing to minimally invasive technique is again propelling the market growth. Also, ongoing R&D for development of more efficient medical devices and tools are again pushing the market growth uphill. The latest report by Value Market Research expects the Global Arthroscopy Device Market to reach USD 6.4 billion by 2025. It was valued USD 4 billion in 2018. The report foresees a 6% CAGR from 2019 to 2025. In 2018, arthroscopy implant emerged as the leading segment and has accounted for maximum market share. Owing to the availability of customized implants to mimic the damaged bone-ligament joint structure, is driving the segment demand. Availability of various types of mobile and fixed implants with specific designs to impart smoother movement of the joints is again fueling the segment growth. By application, knee arthroscopy dominated the segment in 2018. Growing geriatric population prone to knee related chronic conditions is driving the demand for knee replacement surgeries. Also, the rising prevalence of anterior cruciate ligament (ACL), osteoarthritis and rheumatoid arthritis are again boosting the market growth. Regionally, North America emerged as the leading market in 2018 and has accounted highest market share. Rising elderly population coupled with the growing prevalence of musculoskeletal disorders is driving the regional market growth. Established medical infrastructure leading to rising adoption of advanced surgical devices with robotic assistance is further pushing the market growth uphill. As per this study the Global Arthroscopy Devices Market was valued USD 4 BN (by revenue) in 2018 and is anticipated to reach USD 6.4 BN by 2025 with a CAGR of 6%. Arthroscopy devices are used to examine bone disorder such as osteoarthritis, rheumatoid arthritis, tendinitis, and bone tumor. These devices are used during the surgery surgeons use arthroscopy as a means of examining inside the joints. During arthroscopic surgery, a small device is implanted through the incision into a joint. The tiny lens and fiber optic light of the arthroscope is then connected to a camera and monitor which allows the orthopedic surgeon to examine inside the joint and perform different procedures as per the requirement. The rise of the geriatric population along with advancement in technology in the medical and healthcare sector is likely to foster the market growth. Also, the growing prevalence of various bone-related disorder worldwide is again expected to boost market growth. Rising use of robotics across the healthcare sector is expected to create more potential for arthroscopic devices market. This detailed market study is centered on the data obtained from multiple sources and is analyzed using numerous tools including porter’s five forces analysis, market attractiveness analysis and value chain analysis. These tools are employed to gain insights of the potential value of the market facilitating the business strategists with the latest growth opportunities. Additionally, these tools also provide a detailed analysis of each application/product segment in the global market of arthroscopy devices. The broad arthroscopy devices market has been sub-grouped into product and application. The report studies these subsets with respect to the geographical segmentation. The strategists can gain a detailed insight and devise appropriate strategies to target specific market. This detail will lead to a focused approach leading to identification of better opportunities. Furthermore, the report comprises of the geographical segmentation which mainly focuses on current and forecast demand for arthroscopy devices in North America, Europe, Asia Pacific, Latin America, and Middle East & Africa. The report further focuses on demand for individual application segments in all the regions. The report also covers detailed competitive landscape including company profiles of key players operating in the global market. The key players in the arthroscopy devices market include Arthrex Inc., Bioventus LLC, Cannuflow Incorporated, Johnson & Johnson, KARL STORZ Ltd, NuOrtho Surgical, Inc., OrthoSpace, Richard Wolf GmbH, ROG, Smith & Nephew Plc., and Stryker. An in-depth view of the competitive outlook includes future capacities, key mergers & acquisitions, financial overview, partnerships, collaborations, new product launches, new product developments and other developments with information in terms of H.Q.